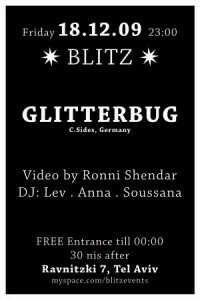 glitterbug» Blog Archive » Next week: two shows in Israel!!! 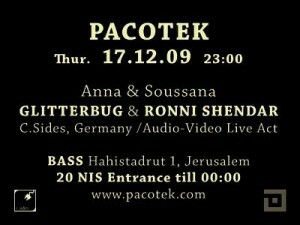 Next week: two shows in Israel!!! 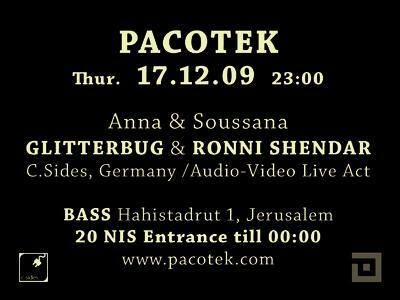 Our precious friends from Pacotek are hosting us for two shows in Israel on December 17th in Jerusalem and December 18th in Tel Aviv. 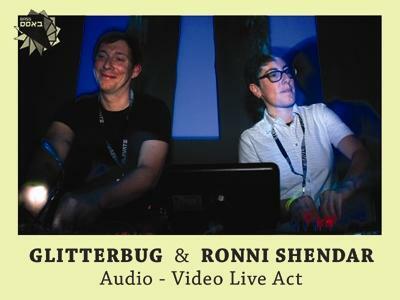 Us means: Ronni Shendar and I will be performing our last two live shows for this performance tour, and also of the current show!! Upon our return to Germany, we will take a little break from performing live, and will start working on the new show, which will be entirely based on new materials of my upcoming second album. On the 18th of December, we will give a small, intimate show in Tel Aviv at the River Studio (Ravnitzki 7, Tel Aviv). Here is the link to the event on Facebook… it’s organized by Pacotek and the friendly people of the Blitz crew. If you are somewhere near, come along!! This entry was posted on Saturday, December 12th, 2009 at 6:58 pm and is filed under Dates / Gigs. You can follow any responses to this entry through the RSS 2.0 feed. Responses are currently closed, but you can trackback from your own site.